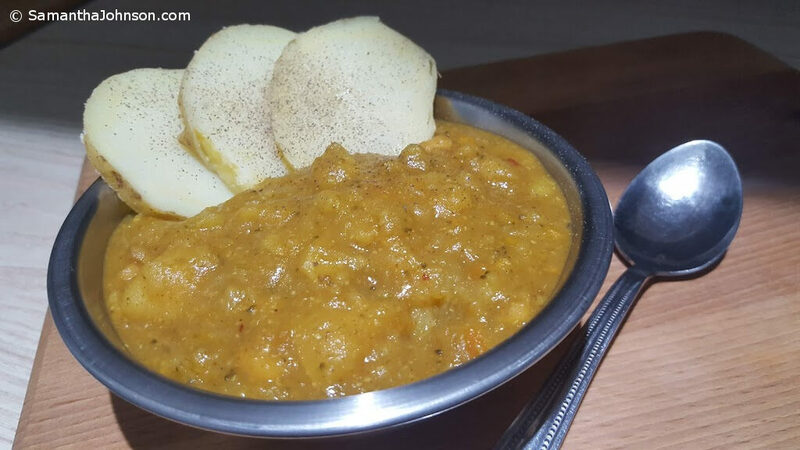 This is a great curried potato dish. This recipe is designed to make a lot so you can freeze portions. It makes approx 8 large portions. Coupled with my Potato soup also frozen into portions you are beginning to have a variety of ready meals available after a long day. Especially if you have to cook for your family separately. I have always made curries both for restaurants and at home in the traditional ways. This however was a bit of a challenge as I wanted no frying and no oil, no meat and mainly potatoes! So the flavour and consistency is everything and the one pictured has just been eaten (a larger portion obviously LOL) and it was delicious! The joy of curry is you can throw a lot of leftovers in the pot. Say if you have some old jacket potatoes or veg in the fridge for example? Sling them in! In this instance I used a chilled jacket I had left over for a garnish dusted with pepper to dip into the sauce. Place a bag of frozen Broccoli and Cauliflower pieces into the pot or pressure cooker. They will disintegrate (that is the plan here), however, if you prefer them complete, microwave them separately and break them up and stir them in at the end. 1 Sweet potato peeled and chopped into small chunks. 6 small Onions or one large Spanish Onion finely chopped. Potatoes (skin on) almost to the top of your pot roughly chopped into 1/4 inch pieces. 2 Beef Stock Pots (liquid stock cubes). A whole pot of curry powder (pictured). The heat required depends on you of course. This is for 7 meals remember. 1 Teaspoon of Garlic Granules. Water. I used about a pint, but you can always add more at the end. Cook on Brown Rice setting for Pressure Cooker as you want it to cook out without being mush. If you overcook don’t worry just do not stir too heavily at the end. The level will have dropped as the Broccoli will have collapsed so just give it a gentle stir with a wooden spoon. 2 Heaped Table spoons of Nutritious Yeast with B12 (pictured, B12 is a much needed supplement for potato diets). This is a great flavour enhancer! Taste it before and after and you add this and you WILL notice the difference! 1 Tablespoon of salt (to taste). 1 can of baked beans (remember this is going across 7 meals! So very little is in each portion), this will also add its tomato sauce and some bite with the beans. 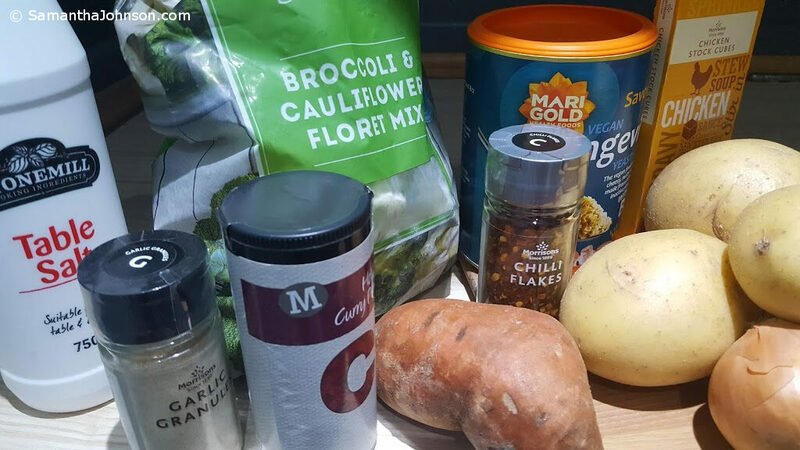 If you REALLY want to stretch this out you could add a can of chopped tomatoes as they are also very low in calories but you may find it become watery and will require potato starch or instant mash granules to rethicken it up again. 1 Tsp Chili Flakes (optional). Stir well to ensure it is all mixed up. It should be a few litres of really tasty hearty curry! Ladle (portions sizes you will be satisfied with or add more if you need it) into containers allow to cool then freeze. Microwave as an when necessary. 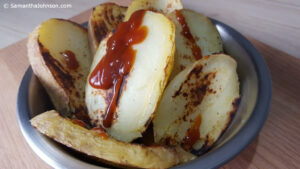 Cooking at the same time for a partner or family NOT on the potato diet. If you are cooking for a partner not on the potato diet, add a chicken breast to a microwaveable container with a glass of water, boil until cooked thoroughly. Chop or tear into pieces or chunks ladle over the curry sauce on a bed of rice. Avoid going in the chippie for chips (French fries) to go with your partners meal as you will want to pick at them!! !